Survive in a world where most of humanity is either dead or diseased, flesh-craving monsters. Plaid Hat Games hits the ball out of the post-apocalyptic park with this perfect blend of cooperative adventure game and Choose Your Own Adventure with a darkly moral twist. 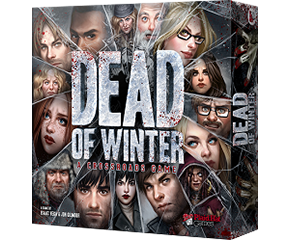 Dead of Winter pretty much sums up what I’m looking for in a game: great mechanics that seem to develop naturally from the theme, total immersion in said theme, and interesting choices that bring players together (and sometimes tear them apart). Beautiful illustration and graphic design work is the icing on the cake, and Plaid Hat were kind enough to supply me with original graphics so this summary and reference sheet could look as good as the game. Thank you! This will be very handy. hey mate thanks for all your hard work on these player aids. One thing with this one though. The main reference sheet does not include the rule for adding zombies with noise tokens but it does on the individual player reference sheets. Not sure if this was intentional, but I just thought I’d let you know. Sorry, I’m confused—I can see that rule in the summary and on the reference sheets. What do you think is missing? Always a relief when I don’t have to make a change – it’s become such a complex process! Update file, save PDF, upload, change game page listing and version number page listing, upload to Boardgamegeek and change listing there, notify on Twitter, Facebook and Google+ – whew! I just made the foam core insert, it’s awesome, just a couple of corrections: I’m not sure if i missed it, but in the foam core insert it doesnt specify the dimnsions of the zombies and the characters space. Neither does it specify the dimensions of the cards/dice area. It’s not difficult to obtain, but I thik that’s missing from the plans. You’re right, don’t know how I missed that and why it hasn’t been mentioned before. I’ll fix it when I can. If I want to play this game with 6 or 7 players, what can I do? I have no idea. Why not check Boardgamegeek to see if anyone has come up with a variant? I’m Australian (living in New Zealand) so I use metric too. Each sheet is a custom size depending on the amount of text required. So whether you use Imperial or Metric, just centre the output on your chosen page size. I looked for the foamcore box insert and it looks amazing. What is the thickness of the foam to be used? It is not written in the guide. Thank you for your effort on these. I’m about to attempt to make a set tonight and I was curious why one side of the short card divider sides needs to be slanted? The dividers are short so you can get your finger in to pick up the cards easily. The edge of it is slanted because – well, it looks better! Quick Question how much foamcore should I buy to complete this project? Come on John I made the plans for you, I don’t have to hold your hand every step of the way do I? 🙂 Buy a few sheets and see how you go! Excellent work as usual sir! Do you plan on doing ones for Dead of Winter: The Long Night ? Hey! Do you think you’ll be adding on a reference for “The Long Night” stand alone expansion? Not sure if I’ll be updating this as I’m not planning to get the expansion – but we’ll see. Do you know if I sleeve my cards if it will make everything too cramped? My apologies if this was addressed and I missed it. It wasn’t created with sleeved cards in mind – I suggest doing your own tests! Wow – just found that black and white version here. I tried to get rid of background somehow in the file from BGG but to no quick avail. It’s cheaper to print and so much easier to read. Thank you!!! I need help. Can you combine your dice pool numbers together? Like if you had two 3 numbered dice can you spend both of those dice to equal to the number you need to attack or search? Outstanding effort yet again, thanks. I think I’ve spotted one minor error in the section just before the Variants. When you talk about survivor cards being added to a crisis after being requested. I understood this was not allowed, you even say it elsewhere. The only way requested items can be added to the crisis is after they have been equiped to a character. Then they can be added, face up. Minor I know, your rules summaries are excellent. These clarifications are taken verbatim from the FAQ. What it’s saying is they can be played into the crisis ‘like any other item card’ – ie, subject to the same restrictions as an item card. Can I use at the same time ability from character`s card and equipment`s ability? For example: Daniel Smith ability`s with equipment`s card “Colt 1911”. It depends on the specific wordings on the cards. In the case you mention, Smith may “kill 2 zombies once per round at his current location. Only roll for exposure once.” This isn’t considered an attack as it’s not identified as such – it’s just an ability. Therefore the Colt ability “once per round, when this survivor performs an attack, do not roll for exposure” doesn’t apply, because that applies used when an attack is being performed. I made this insert yesterday and it’s just perfect!!! Are you planning to make more inserts than you already have because your plans are great!